Product prices and availability are accurate as of 2019-04-08 05:56:35 EDT and are subject to change. Any price and availability information displayed on http://www.amazon.com/ at the time of purchase will apply to the purchase of this product. Home dial-up Internet service doesn't have to be slow. 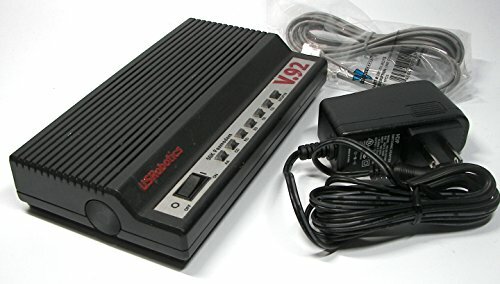 U.S. Robotics' external 56K faxmodem (model USR325686E) is designed to make your dial-up connection as fast and easy-to-use as possible. An e-mail with attachments will fly from your out box up to 50-percent faster than it would from competing devices. Quick Connect lets you establish your connection rapidly, so you spend less time simply getting going. Worried about missing calls while you're online? Let that one go: a U.S. Robotics feature called Internet Call Notification (ICN) lets you screen incoming calls so you can take the important ones. Even better, Modem on Hold lets you take calls while online without dropping your Internet connection--there's no need for a second phone line. The modem's ControlCenter lets you customize your upload and download speeds--choose to surf the Web at top speed or to send e-mail attachments faster. Built-in line-probing technology helps you stay connected even under the worst line conditions, and the modem is software-upgradeable, too, so you can download new features and enhancements as they become available. Included software turns your computer into a feature-rich fax machine--send faxes from any Windows application and receive incoming faxes at any time. The software also supports delayed and broadcast faxing. The modem is compatible with Windows XP, Windows NT 4.0, Windows 2000, Windows ME, Windows 98, Windows 95, Windows 3.1, Linux, and DOS. 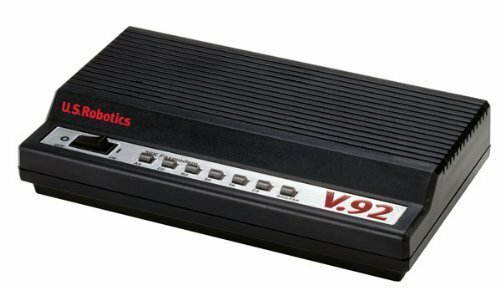 U.S. Robotics 56K Faxmodem, AC power adapter, RJ-11 phone cord (7 feet), quick-installation guide, installation CD-ROM. Note: call waiting and Caller ID require service from your local phone company.